Geoffrey Pagen, well known for his work in ceramics, broadens his reach with this latest exhibition Sum of the Parts. In addition to his distinctively painted clay slabs, he pairs some slabs with stone, presents works on paper, and continues a recent exploration into fired enamel on steel, a process inspired by a commission for the US Embassy in Bujumbura, Burundi, Africa. 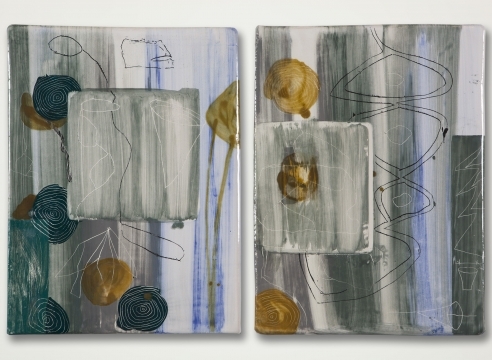 Through all of the work, his continues his engagement with inscribing surfaces with energetic organic, geometric, or cuneiform-like markings, and utilizes glazing that ranges from the opaque to the iridescent. His surface treatments result in works that have a sense of motion and lightness, or offer space that is meditative and still.